I went a trip to Alishan in mid January with members of Multi-Language Exchange Club. I bought so many postcards and picked this up to send to myself to record the trip. Sometimes it is not easy to distinguish a sunrise picture from a sunset one. When we see the sun on-site, it may affect the feelings. But both are beautiful at the moment in the picture. This postcard is a reply to my thank you postcard. 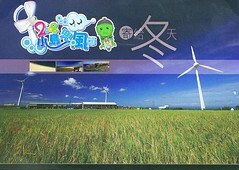 I visited Penghu as a active participant in September 2008. I did not stayed in this guest house, but the hostess gave me a well guided tour. 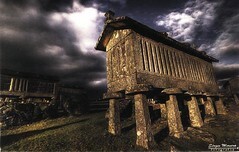 It is situated in a special village of Penghu, Ai-men. The village is one of the rare villages without fishing port but a beautiful beach. 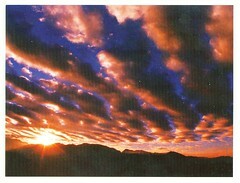 The postcard is a promotion of winter tourism. I started my Penghu life in late November 2007 and ended in July 2008. I love Penghu so much. Everything related to Penghu can make me happy. Figas made this postcard. I have no idea what he wanted to express and what is the building for. Maybe he just wanted to keep silent by showing me the grey sky. After graduated from the university, Wang moved back to New Zealand and have a boring life. I encouraged him to have some hobbies and sent him a postcard. This postcard is my reward. The postmark is just one day later as Wang's signature, but the postcard traveled over two months. An early Christmas card turned into early Chinese New Year card. 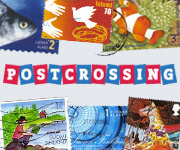 Postcards are link to the world, but they also can let you learn something new of your place. You need to study very well to write the most important thing in the small piece of paper. This one three hill in Auckland has no tree but the obelisk. I learned some history from Wang. Thank him.